The BNP Paribas Open is wonderful. This year it was odd. It’s held in a Southern California desert, but there were chilly temperatures and a rainout. There were more than the usual spate of upsets – down went Tsitsipas, Zverev, Kyrgios, Osaka and Halep. Goodness, a lucky loser that few had heard of was the last Serbian standing – not No. 1 Novak Djokovic, who lost to Philipp Kohlschreiber for the first time in ten years. ATP chief Chris Kermode, who had taken the men’s game to formidable heights, was taken down for curious inside-the-beltway reasons. Elders with achy bones went far. Ivo Karlovic, 40, reached the fourth round and a 38-year-old lady named Venus made it to the quarters. Bianca Andreescu, an 18-year-old Canadian meditator who was outside the top 150 two months ago won the women’s final. For the first time in tennis history, players named Hubert and Felix (that would be Hurkacz and Auger-Aliassime) created some hefty buzz. And three of the most charismatic stars in the universe – Serena, Gael Monfils and Rafa – withdrew before or during their matches. In particular, Nadal’s withdrawal before a highly anticipated semifinal against Roger Federer dashed hopes for a memorable clash of titans. Still, on St. Patrick’s Day, it wasn’t the luck of the Irish, but the luck of tennis fans who have had a Swiss magician to sustain their hopes for 21 years. The Indian Wells loudspeakers played Paul Simon’s song that asks, “Where have you gone, Joe DiMaggio? Our nation turns its lonely eyes to you.” And today we turned our eyes to Federer, the man who, it is said, “cannot avoid beauty.” But he’s also the man who can’t avoid making news. Just a couple of weeks ago he won his 100th tournament near a different desert on a distant shore. That was Dubai. Today in Indian Wells, Roger was on fire as he raced to a 6-3 first-set over the Austrian Dominic Thiem. His sixth BNPPO title would put an end to all the oddities that had defined this year’s tourney. But Thiem, the only active man under 27 to reach a Slam final, is a considerable foe. The 25-year-old is a powerful ball-basher off both wings who has wins over the game’s best – Djokovic, Nadal and Murray. To reach last year’s French Open final, the best Austrian since former No. 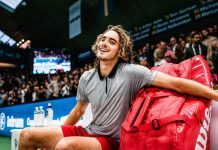 1 Thomas Muster downed Alexander Zverev, Stefanos Tsitsipas and Kei Nishikori. He and Federer, who have two of the sweetest one-handed backhands in the game, had split their four previous meetings. So it was hardly surprising that Thiem counter-attacked. Midway through the second set, he played some remarkable defense. He abandoned his kick-serve that had worked so well against Milos Raonic on Saturday’s semi. He hit imposing flat serves and unleashed explosive down-the-line backhands. All the while, Roger’s serve faltered. Thiem broke to go up 3-1 and then, with a 126 mph first serve, claimed the second set 6-3. The final set seemed to be an inexorable march to a tie-break. Yes, the younger Thiem was more powerful. His forehands averaged at an astonishing 84 mph. But Federer served brilliantly and actually had more winners than his foe, who had never won a Slam or a Masters. Swiss flags flurried in the golden desert light. Still, Thiem bravely hit out, found the lines and brushed off a break point in the seventh game. At its core, tennis is a matter of decision-making in the heat of the moment. And Federer is arguably the best decision-maker of all time. He has an uncanny knack. But then an odd thing happened. At five-all in the third, Roger made shocking decisions. He hit not one, but two drop shots. Thiem sprinted to both and managed to hit inspired cross-court winners – can you believe it? The No. 8 player in the world then promptly unleashed a forehand winner to score a critical break and go up 6-5. On Thiem’s first championship point, a Federer forehand caught the net and the BNP Paribas Championship went to a player who, prior to coming to Indian Wells, had won only three matches this year. Inexplicably, Federer suffer his fourth loss in the finals in the last five Indian Wells he’s played. It was kind of an odd ending to an appealing yet kind of odd tournament. But let’s not take anything away from Thiem. After all, he’s the Wizard of Odd. And, lest we forget, odd can be wonderful.